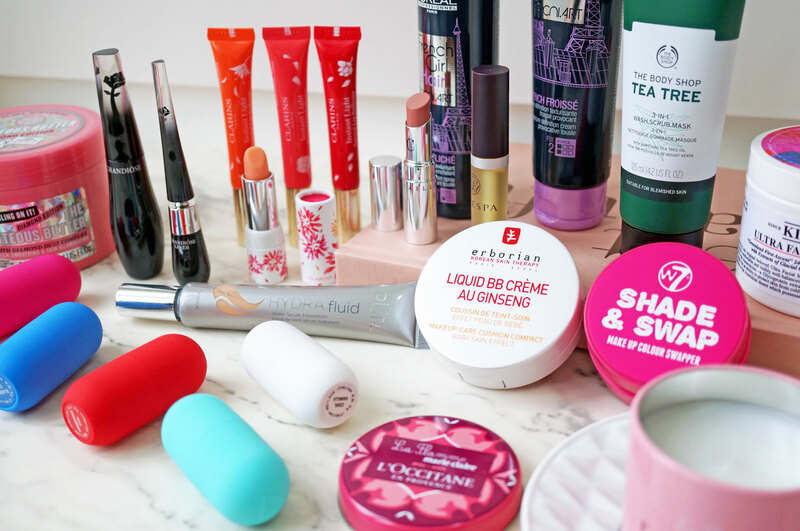 There have been so many fantastic beauty launches recently, I thought I’d put a post together to show you some of my favourites that are definitely worth checking out. There’s a mixture of high end as well as affordable products here, so hopefully there will be something for everyone. Get your wish lists at the ready! Ok so let’s start with the L’Occitane La Flamme Candle (£8.00 at L’Occitane) – this just ticks all the boxes for me. You may know by now that I have a slight candle obsession, and this one smells lovely, with a delicate citrus scent, it’s also very affordable and on top of that 100% of the profits go to charity. 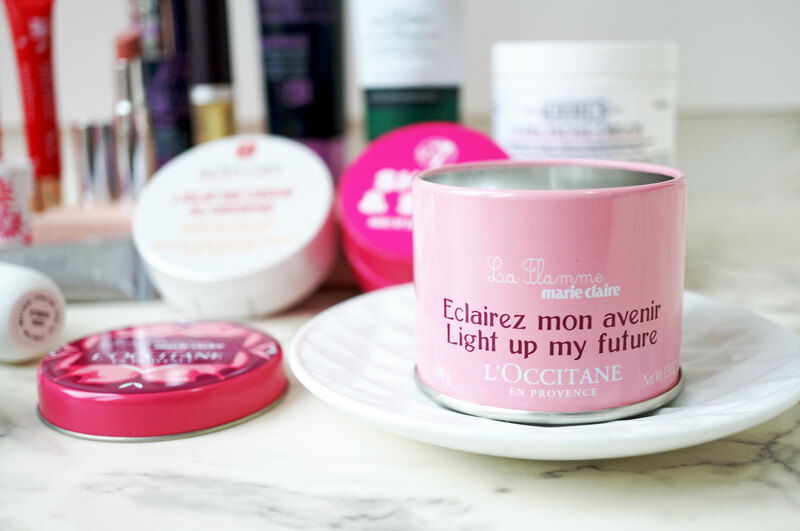 The limited edition La Flamme Candle has been developed in an exclusive partnership with Marie Claire in order to raise funds for the education of girls and young women in developing countries. 100% of the profits will be donated to selected charities supporting girls’ schools and education projects in Cambodia, Uganda, Sierre Leone and Burkina Faso – this is a must have! Next, a couple of new products from one of my favourite beauty brands, Clarins. 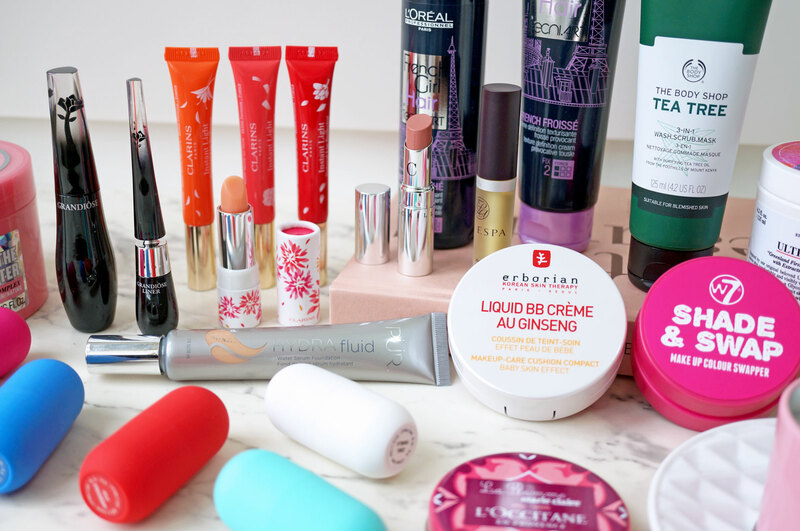 I love Clarins lips products and their Instant Light Natural Lip Perfectors (18.00) and Daily Energiser Lip Balm (£18.00, both at John Lewis) are just gorgeous every-day products. The Instant Light Natural Lip Perfectors now come in three new shades – Pink Shimmer, Orange Shimmer and Red Shimmer – giving lips an instant plump, glossy shine which nourishes and prevents dehydration. And the Daily Energiser Lip Balm offers 8 hours of hydration whilst smoothing and plumping – it also subtly enhances the colour of your lips. Another favourite brand of mine, Lancome have recently launched their Grandiose Liner (£23.00) and Extreme Mascara (£25.00) both at House of Fraser. The Grandiôse Liner is a truly innovative product offering a bendable wand which you can angle pretty much however you like, to help you get right into the base of the lashes and create the perfect line. It also has an ultra fine tip for creating a super sharp cat-eye, and the product formula has a long-lasting, smudge-resistant matte finish. The Grandiôse Extrême Mascara also features a ‘Swan-Neck’ wand and high-precision brush which grabs lashes close to the roots to beautifully fan them out on application. Grandiose Extreme gives extreme volume and an ultra intense longwear look for up to 24 hours. And the Pur Cosmetics HydraFluid Water Serum Foundation (£28.00 at Beauty Bay) – I actually have a fantastic powder compact from Pur which I’ve been using for a long time, so I was excited to try out their latest foundation offering. The Hydra Fluid Water Serum Foundation utilises a unique Water Complex which combines water sourced from the Swiss Alps to penetrate the deepest layers of the skin with intense hydration. The formula is thin and watery, feeling lightweight on the skin and giving light to medium coverage. Those with dry or dehydrated skin who are looking for a lightweight base should definitely check this out. 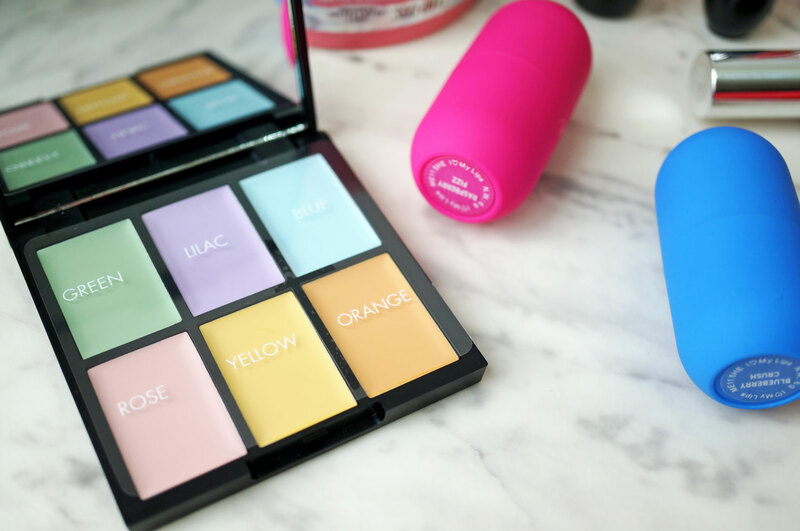 Colour correcting products are everywhere at the moment, and this Sleek Colour Corrector Palette (£7.99 at Boots) is a fantastic budget option. It contains six easy-to-blend colour correctors to minimise skin imperfections and counteract discolouration, leaving you with an even base for flawless foundation application. 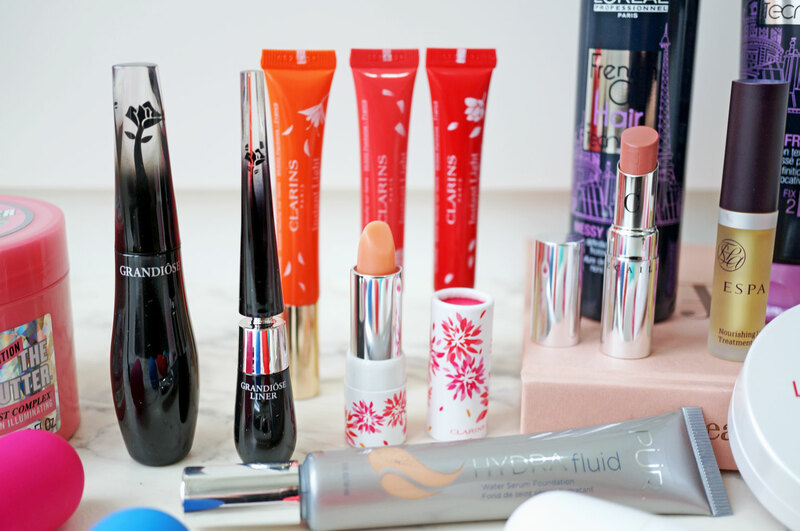 And if you’re looking for some new lip balms on the cheap, this I Heart Makeup I Heart My Lips Set (£10.00 at Tam Beauty) could be right up your street. The set includes five pill shaped balms in an assortment of flavours for only £10.00 – so there’s one for your bag, your desk, your car… you get the idea! 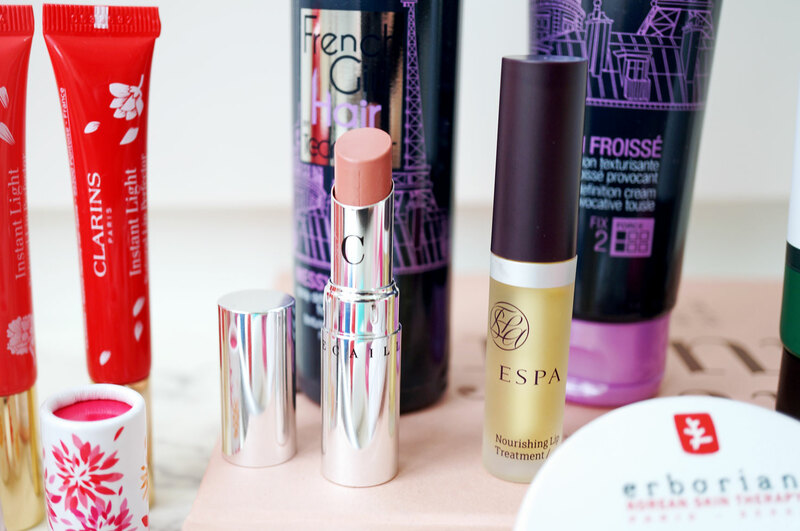 On the subject of lip balms, the ESPA Nourishing Lip Treatment (£19.00 at John Lewis) is definitely worth picking up if you’re looking for something a little more intensive. This nourishing Lip Treatment is packed with active ingredients to instantly smooth and soften the lips, whilst adding a hint of gloss. My dry lips have been loving this lately! While we’re talking about lips, if you’re looking to treat yourself, personally I think you can’t beat a lipstick. And if you’re feeling pretty flush, a Chantecaille Lipstick (£30.00 at Space NK) is definitely worth the money – this lipstick is smooth and comfortable, and the formula is enriched with vitamins A and C and emollient amino acids for a super luxurious feel on the lips. On to hair now – L’Oreal Professional have a couple of new styling products, in the form of French Froisse Texture Definition Cream, and Messy Cliche Texture Definition Spray (£11.95 each at HQ Hair). So basically the cream is for thick hair, and the spray is for fine hair, and they both pretty much do the same thing, giving you tousled, textured lengths with natural shine. And not forgetting The Body Shop Tea Tree 3-in-1 wash scrub mask (£8.00 at The Body Shop ) – this is a multi-use 3-in-1 product which can be used as a wash to remove excess oil, a scrub to exfoliate and unclog pores, or a mask to combat blemishes and tighten pores. I love multi-tasking products and I know this will definitely get a lot of use in my household. 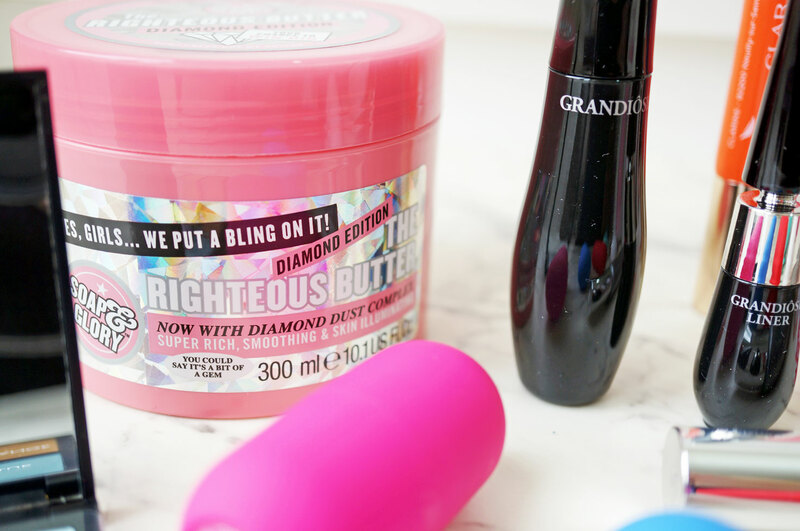 Soap and Glory are alway coming up with gorgeous new products, and their latest The Righteous Butter Diamond Edition (£8.00 at Soap & Glory) is a must have for S&G fans! This is basically a re-vamped edition of their famous Righteous Butter, with added pearlescent shimmer, mica powders and real diamond dust! 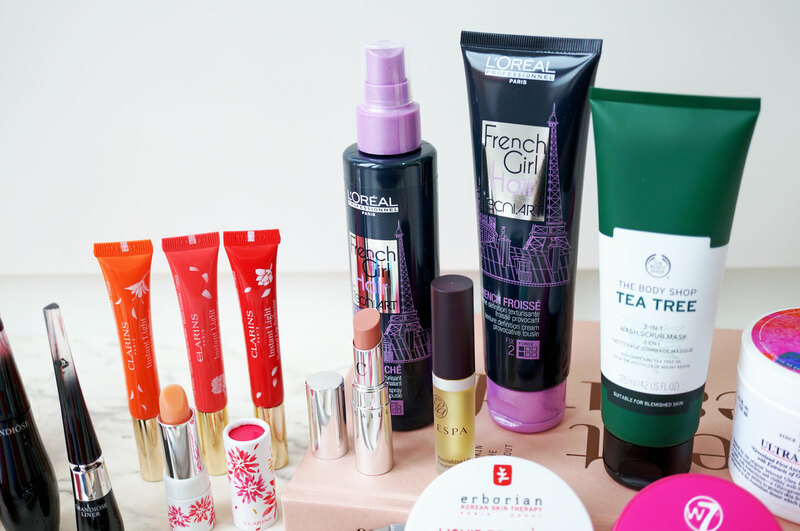 Next we have the Erborian Liquid BB Creme Au Ginseng ($48.00 at Sephora) – I love a cushion foundation and Erborian’s Liquid BB Cream is a fantastic compact. 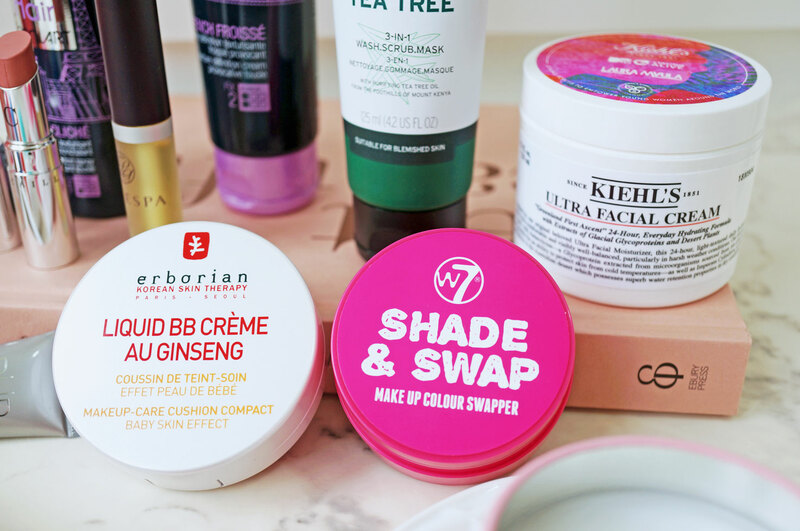 It contains Ginseng, known in Korea for its smoothing properties and gives lightweight, sheer coverage to help even out skin tone, leaving the complexion feeling fresh and moisturised. I also love the new W7 Shade & Swap (£4.95 at W7) – this handy little pot instantly cleans your makeup brushes so you can swap between colours quickly and easily. Just sweep your brush over the sponge a couple of times and Bob’s your uncle! Kiehls is another favourite skincare brand of mine, and their MTV Staying Alive Ultra Facial Cream (£43.50 at John Lewis) is definitely worth picking up if you’re in need of a new moisturiser. This Limited edition Ultra Facial Cream continuously replenishes moisture throughout the day, leaving skin feeling smooth, soft and hydrated. And for each pot sold, Kiehl’s will give £10.00 to the MTV Staying Alive Foundation to support 3 projects around the world to empower young women. Next Post Every Single Beauty Advent Calendar for Christmas 2016!